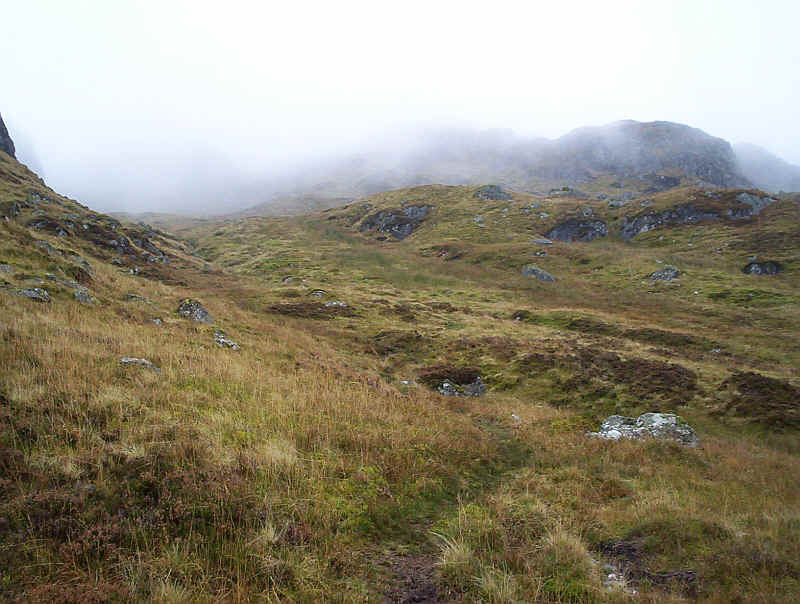 I climbed Beinn Chabhair from Inverarnan in October 2009, the last of the Crianlarich group of hills that I hadn't climbed. 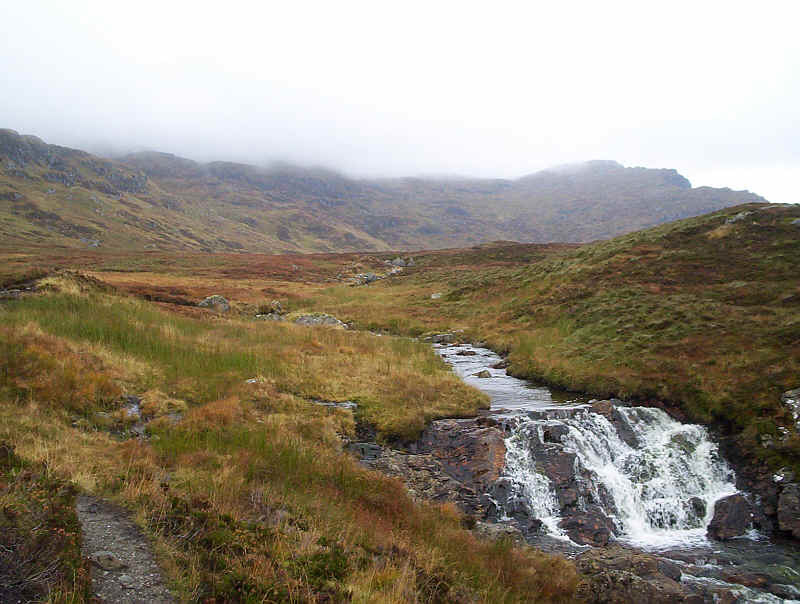 I took the Uig Citylink bus from Glasgow arriving just before 08.30. 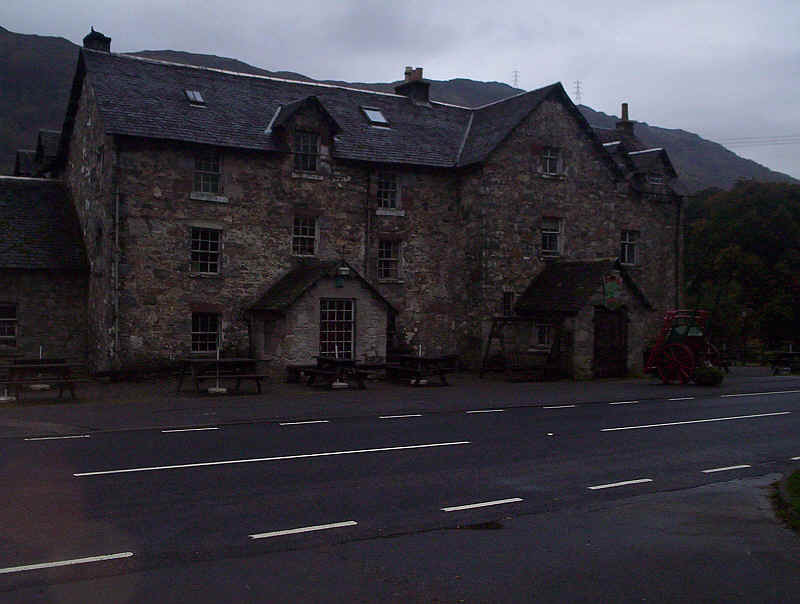 Here's the "notorious" Drovers Inn at Inverarnan. I'd enquired about having breakfast before starting the walk but was told they started serving breakfast at 9.00 am on a Saturday so it was currant teacakes and flapjacks instead. .....by the side of the river. 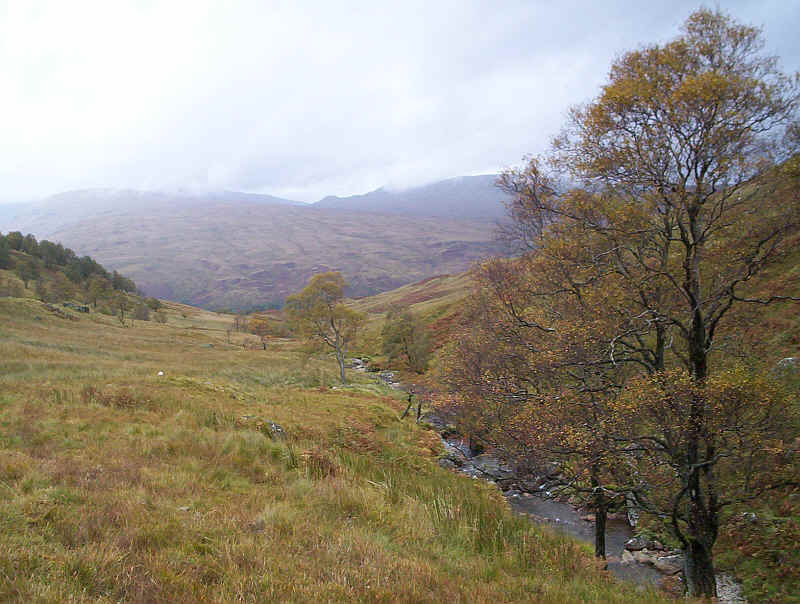 .....and climbs steadily above the valley floor with views towards Ben Vorlich. 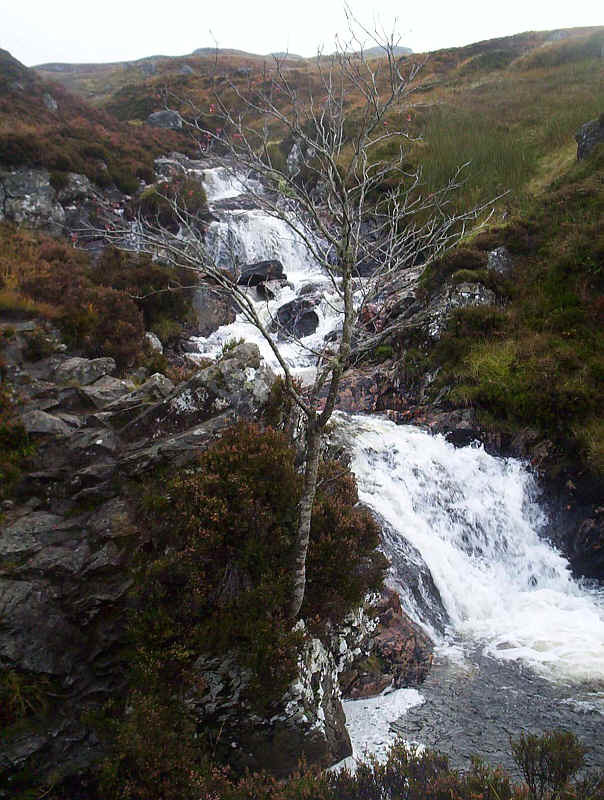 ....the Beinglas waterfall. A sharp left turn in the path keeps the way forward well clear of the water. 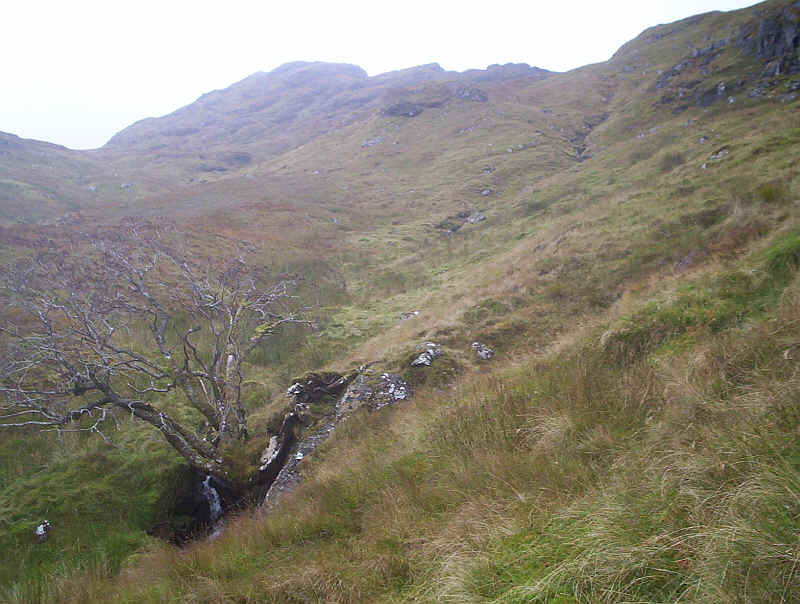 ......and more steep climbing with the Ben Glas Burn far below. 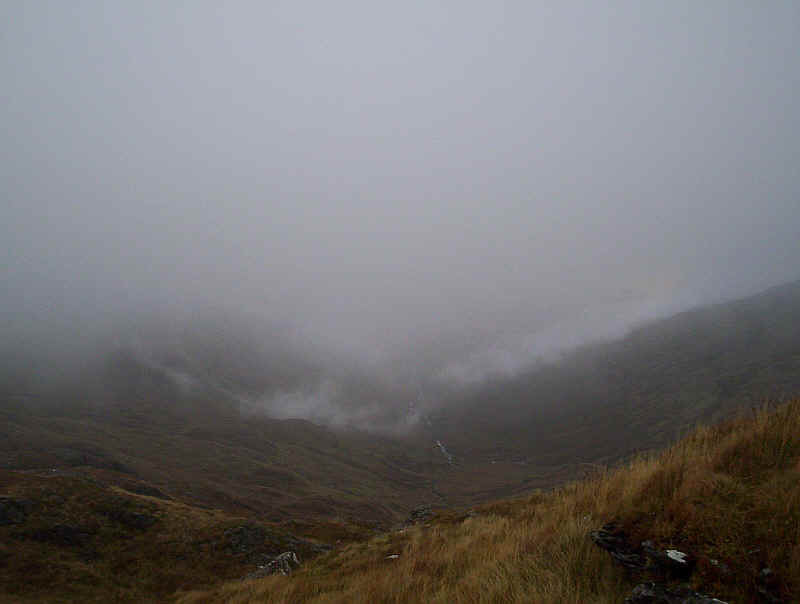 Ben Vorlich kept disappearing under a cap of cloud whilst Loch Lomond can just be glimpsed. 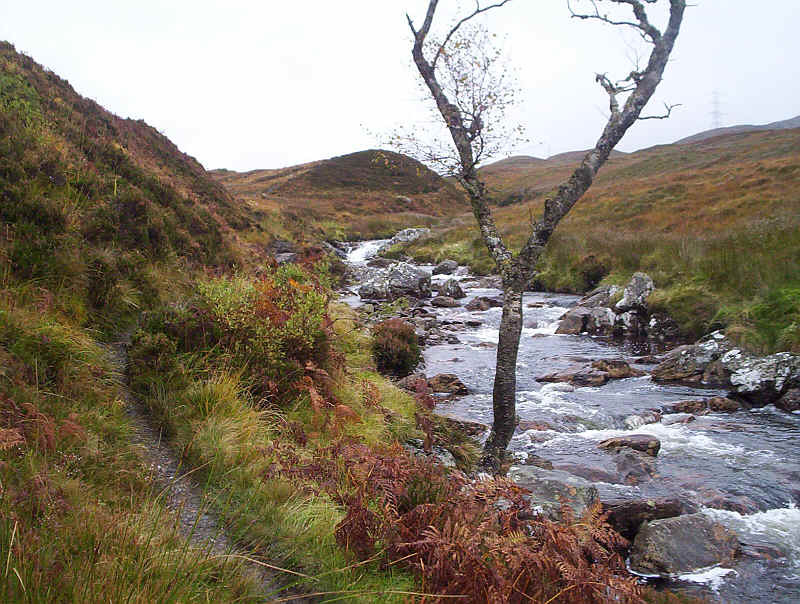 A delightful feature of this walk is the continual presence of the burn which varies considerably in character. 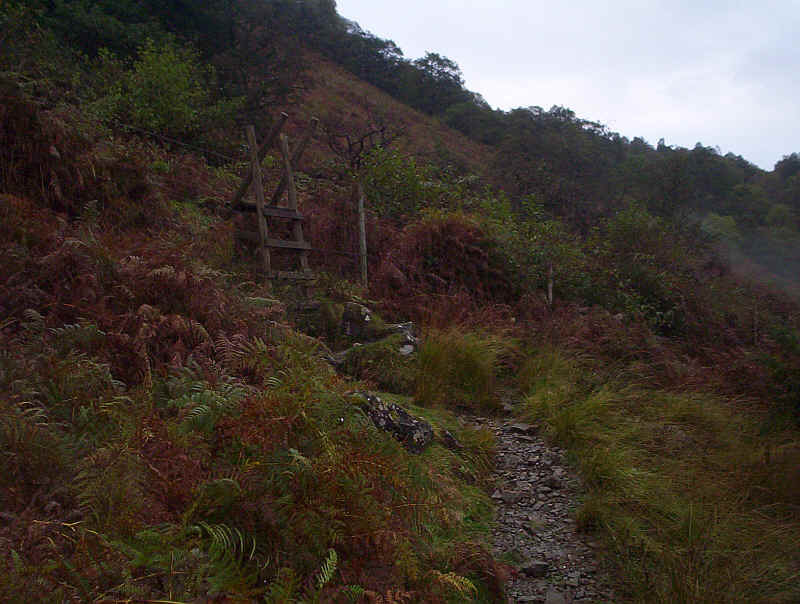 The path actually splits in two at this stage but the best views are from the upper path. 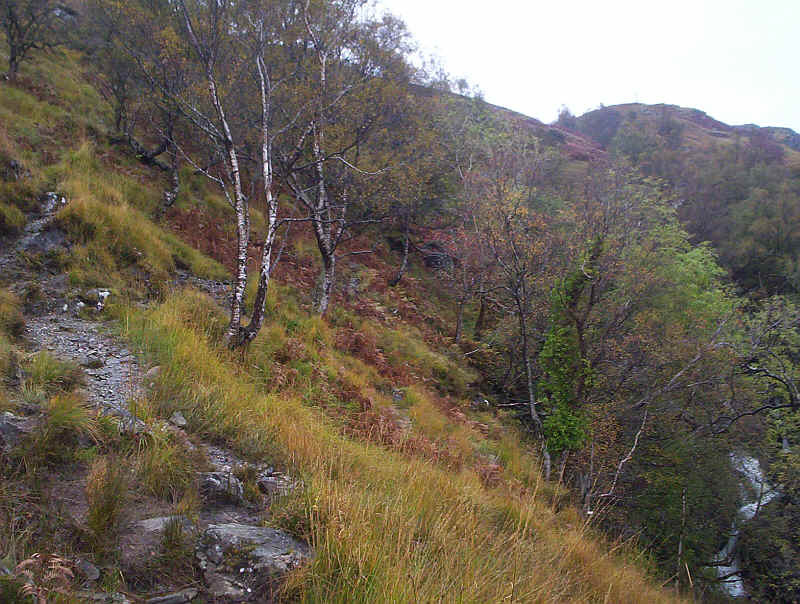 Suddenly the climbing is over and the path emerges onto a much more level section. It's almost a "hanging valley". 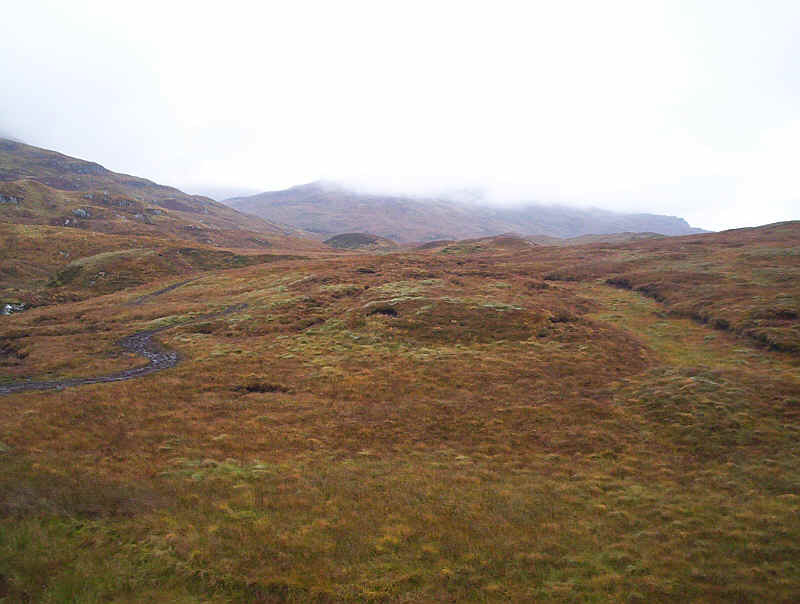 The burn meanders across this section through numerous drumlins, whilst an all terrain vehicle track appears from the north. This could be used as an alternative route to, or from, this point. 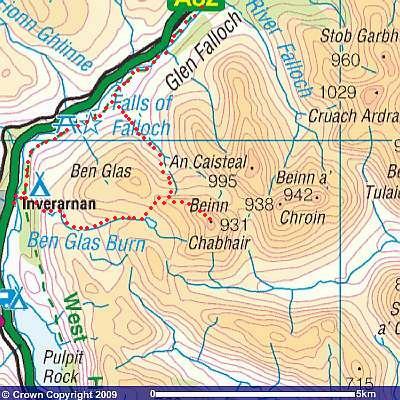 It would mean walking north along the West Highland Way from Beinglas and then heading south again. 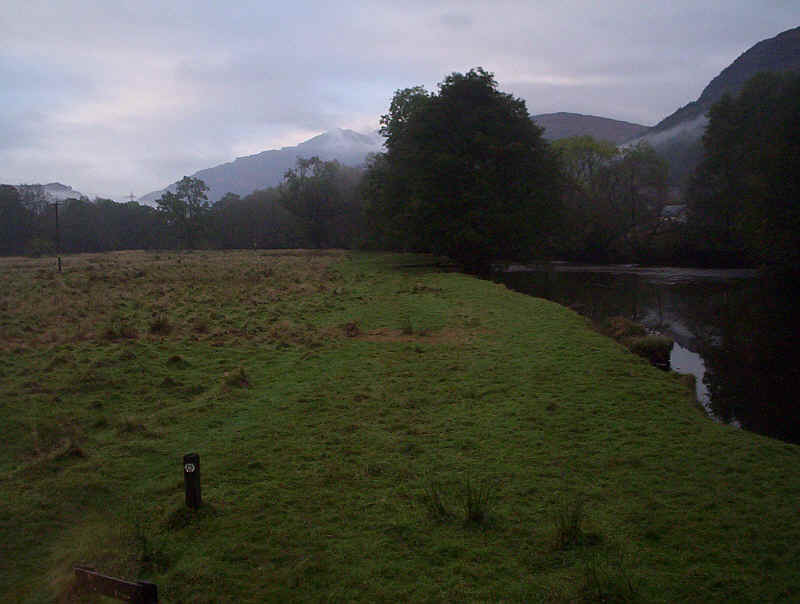 The first view of the day's objective suddenly appears about four kilometres away. 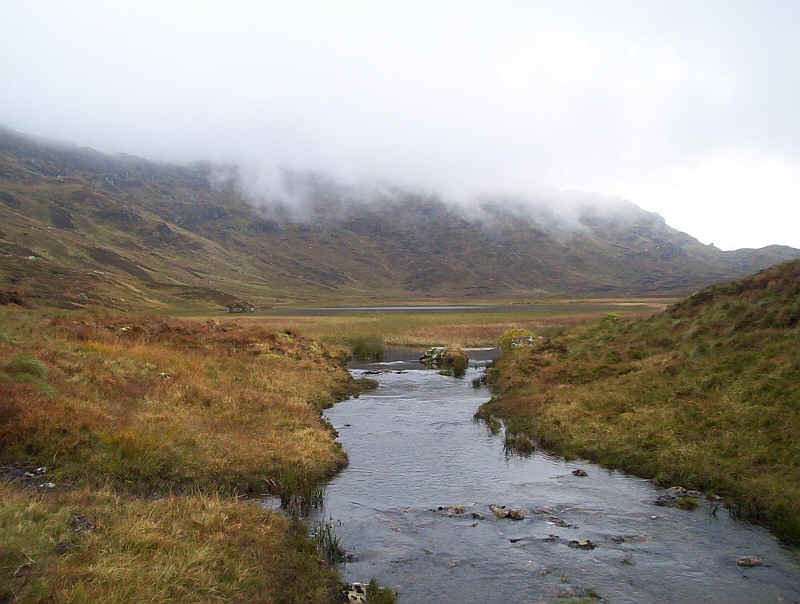 Beinn Chabhair is somewhere over to the right under all that cloud. 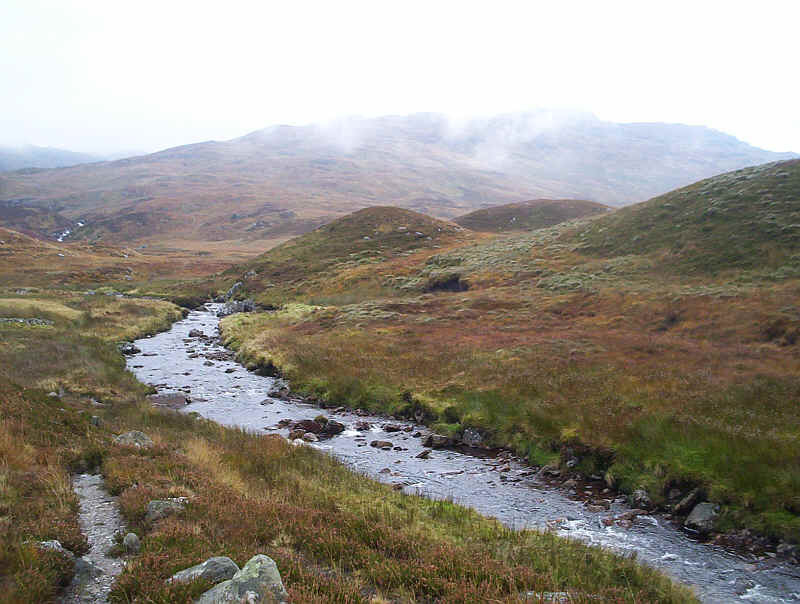 The path continues by the burn towards a really squelchy section. There's a very short "interesting" section where the path crosses a tributary stream (just visible coming into the main stream from the left) and immediately clambers up some very slippy rocks right by the side of this rather deep pool. 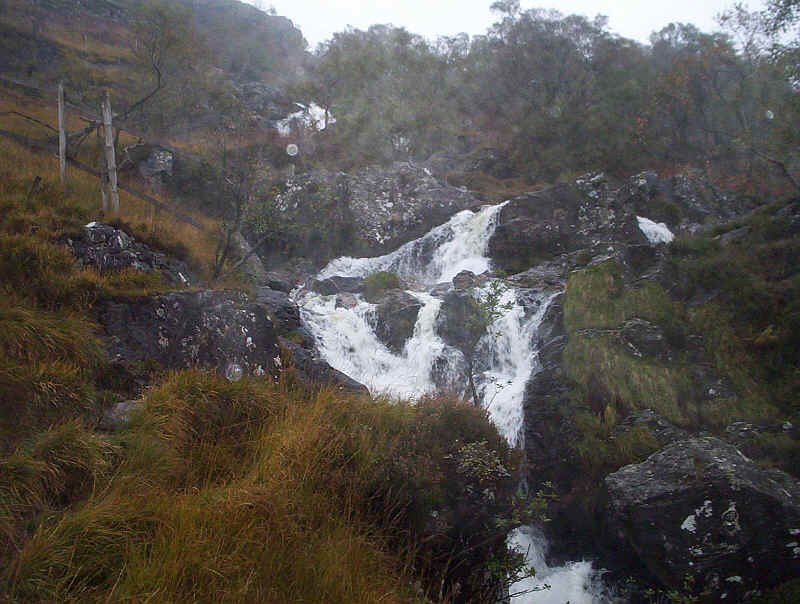 Should the streams be in spate this might be rather tricky. 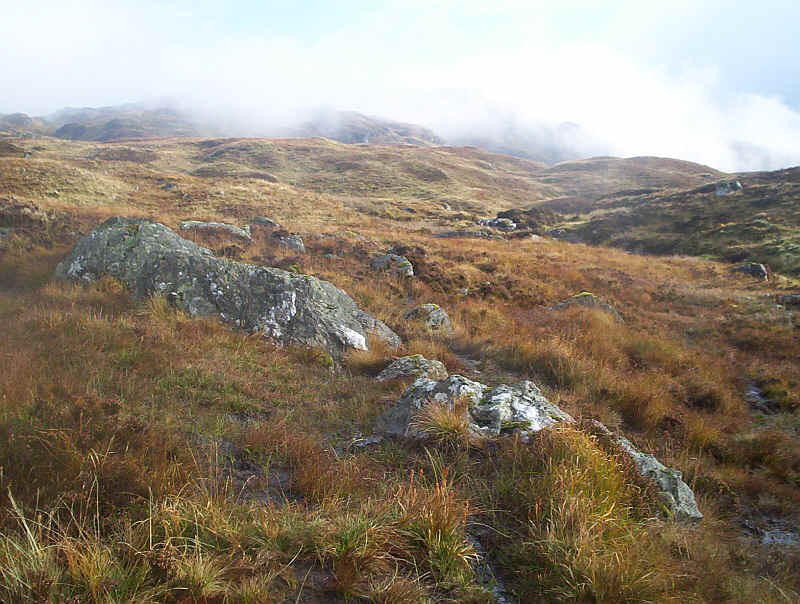 ....the beautiful setting of Lochain Beinn Chabhair. Although I didn't see any, the air was full of stags bellowing. 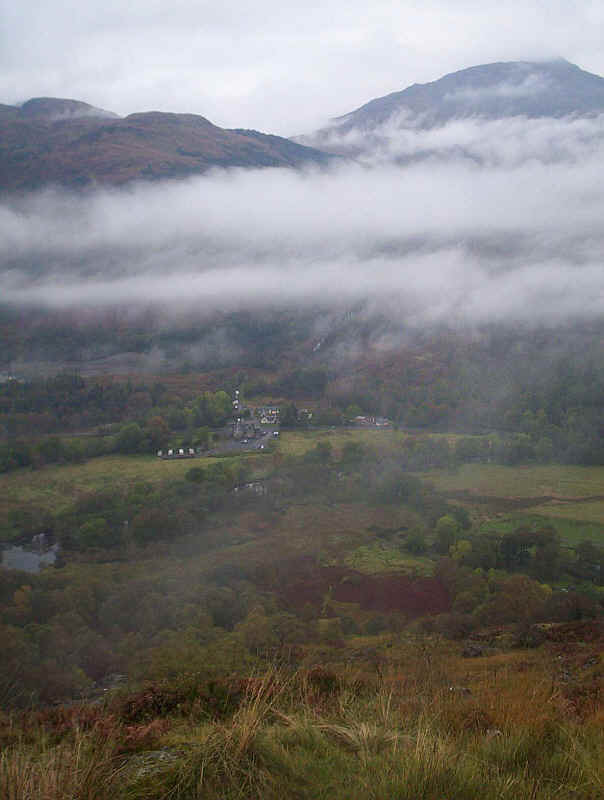 .......slightly higher up it becomes very clear. As is often the case it's much clearer seen from above. Probably the best place to leave the burn side path is near that final sharp bend. 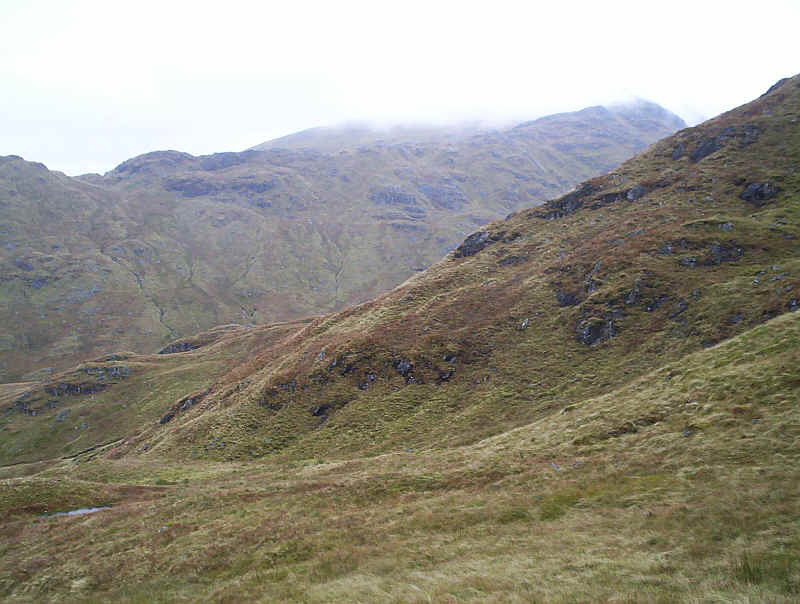 The path heads towards this curious and rather dramatic notch, but then veers off to the right to climb to the summit of Meall nan Tarmachan. 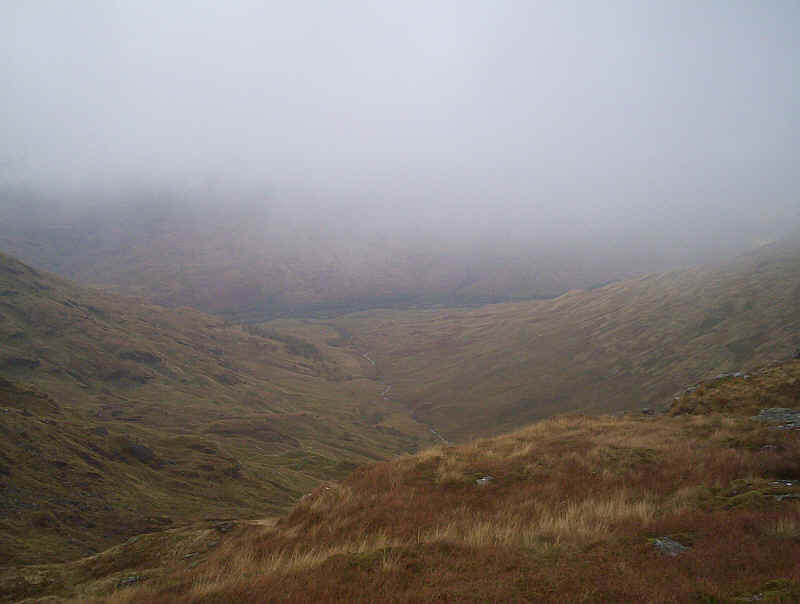 At this point the mist became too thick to take meaningful photos but the track is clear and easy to follow. 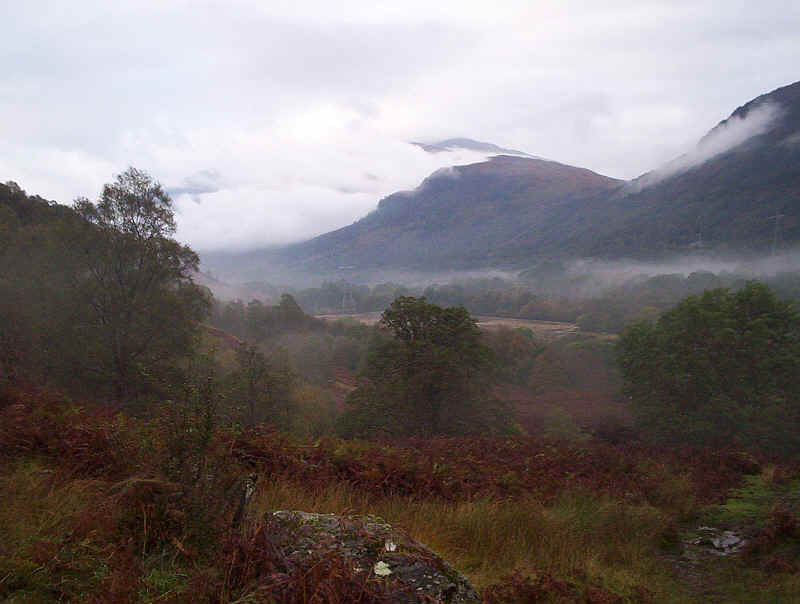 Occasionally the mist cleared slightly so some impression of the terrain was possible. 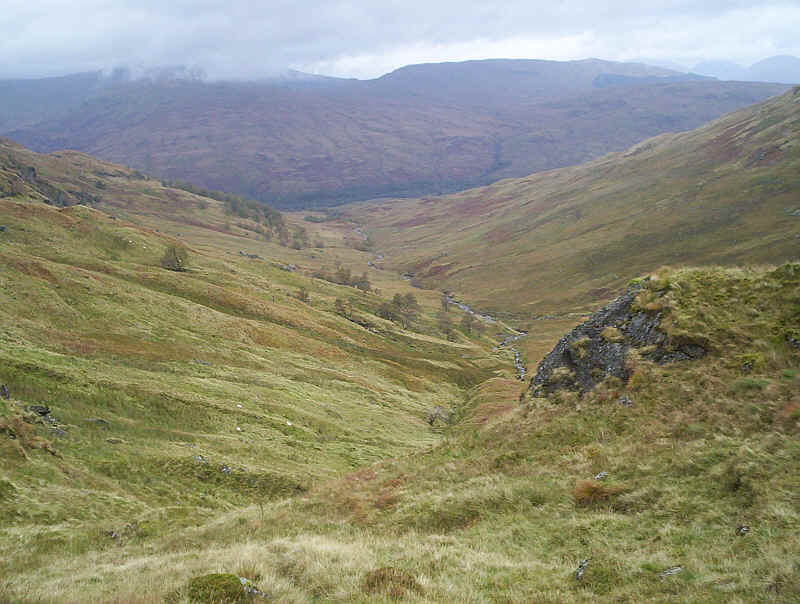 Looking down to the north into the Allt a'Chuillin made me wonder if this was a possible return route, especially since I was intending to walk to Crianlarich in the afternoon. 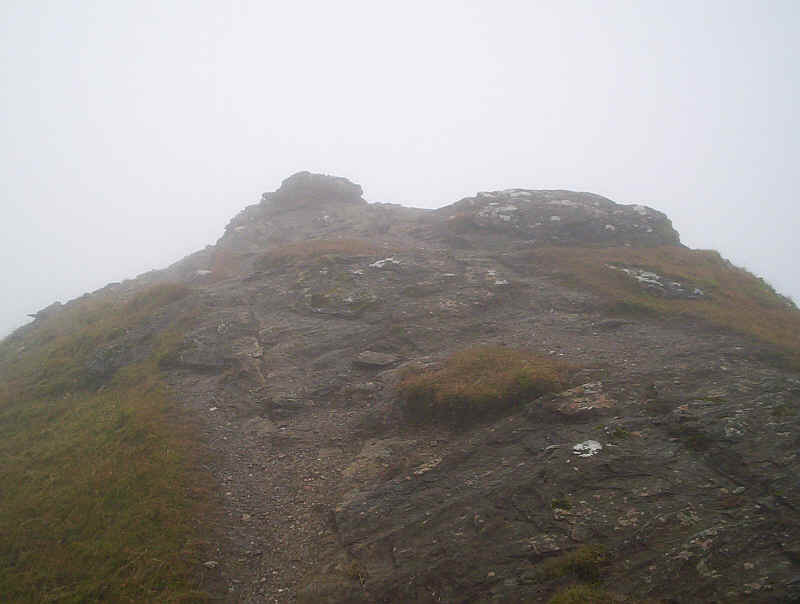 The cairn of Beinn Chabhair sits on top of the relatively narrow summit ridge. There's nothing exposed about it although this photo might suggest otherwise. Just after I arrived a young couple from Ayr arrived from the other side of the cairn. 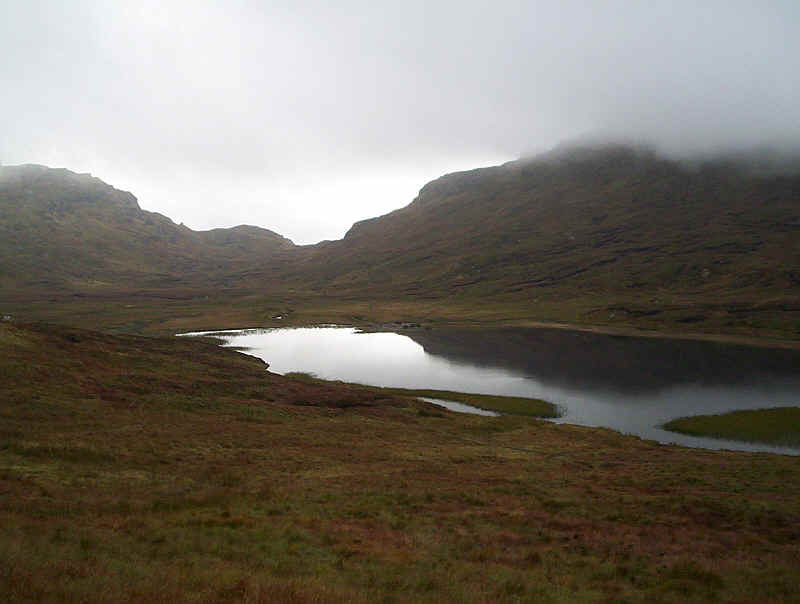 They'd come up from the lochan from the far end of it. All three of us being teachers we spent some time sharing experiences whilst we had lunch as well as discussing the Munros we'd climbed. 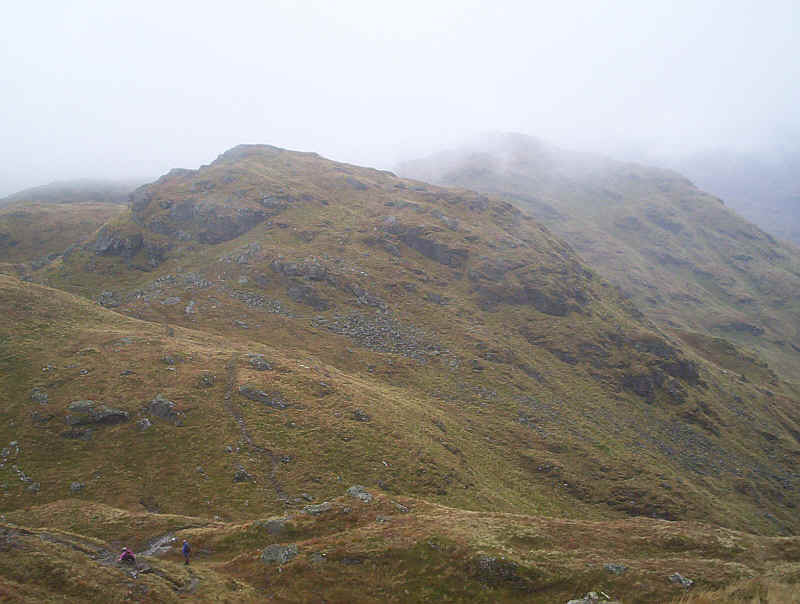 After lunch we all headed off downhill but as I tend to walk slowly when descending I told them to leave me. 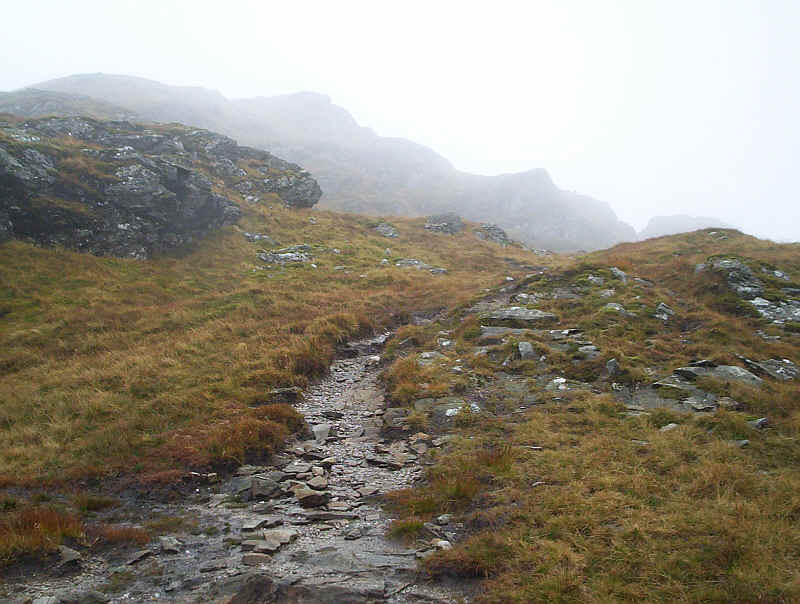 As I descended the hill the mist slowly began to clear and I was rewarded with this view of the enjoyable path down the ridge. 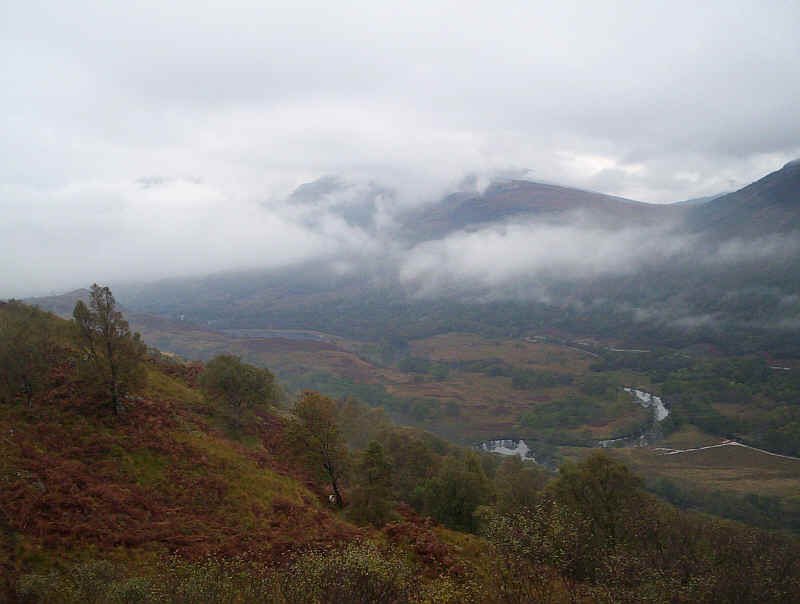 There were also views down to the Allt a'Chuilinn. 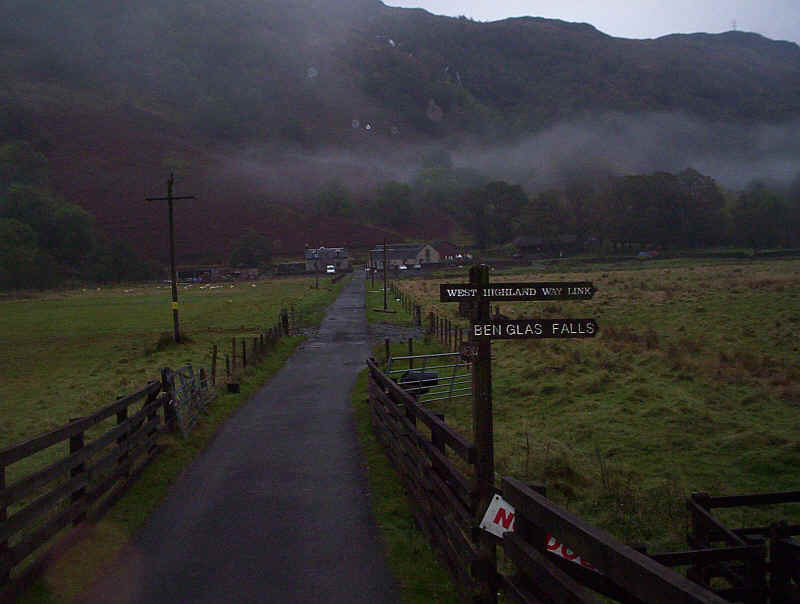 This definitely looked more appealing than walking back down the path to Beinglas Farm. 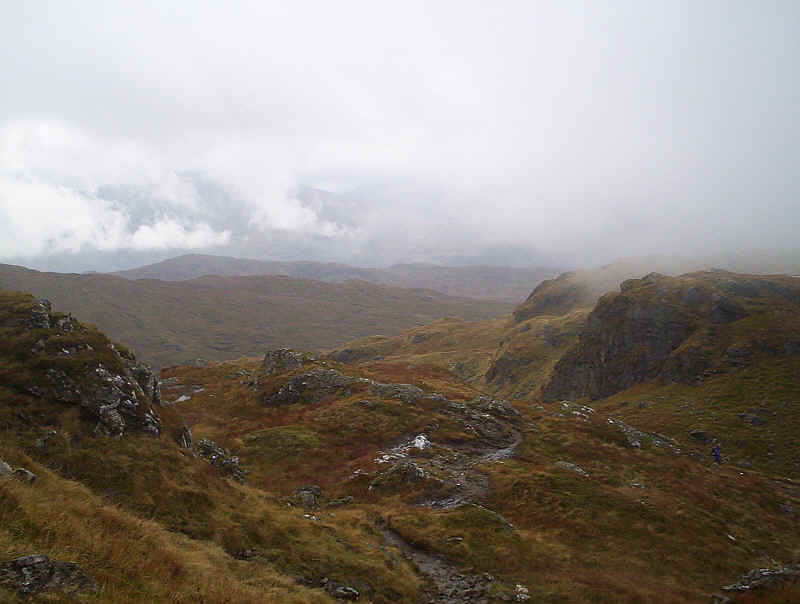 The path drops down the ridge to Meall nan Tarmachan. 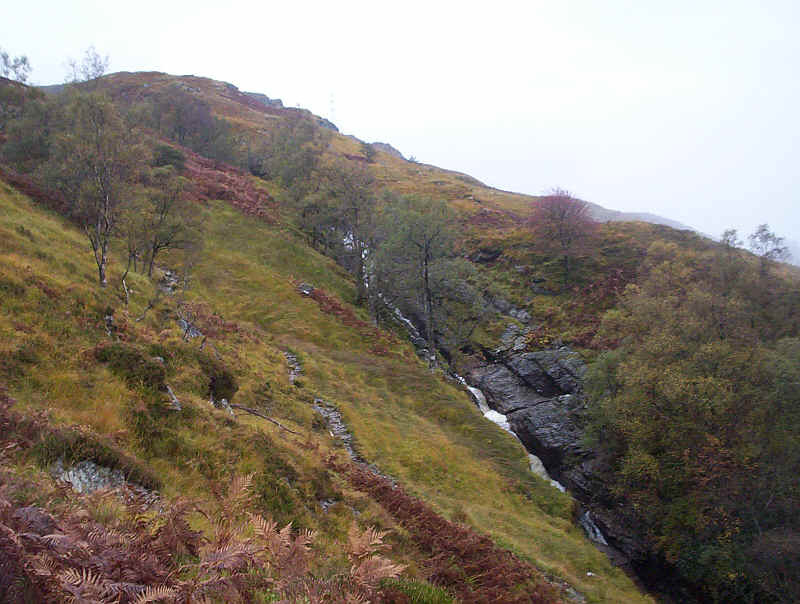 At a dip in the ridge near spot height 700 there's an obviously easy way down to the Coire a'Chullinn, so I decided that this was a much more preferable way back down to the West Highland Way than the path down to Beinglas Farm. 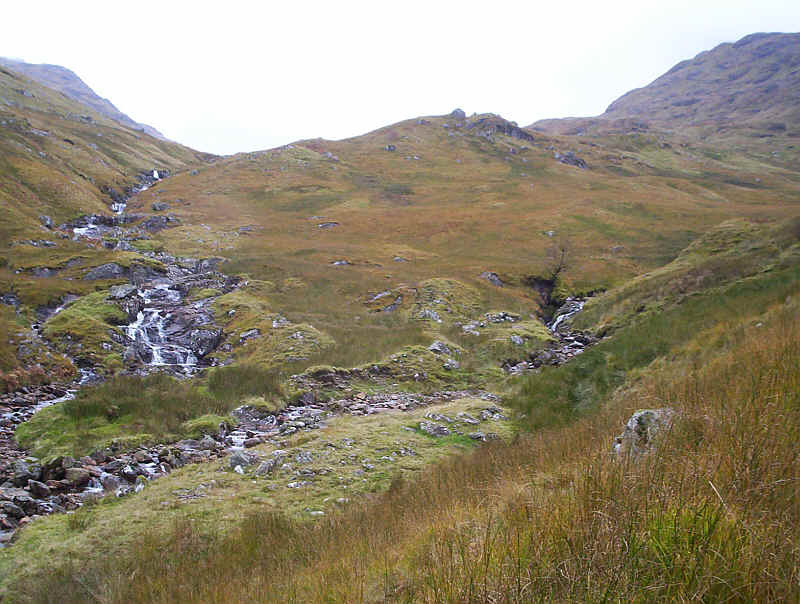 I headed for NN35912 18748 and then followed the various small streams down the hillside towards Allt a'Chuillin. 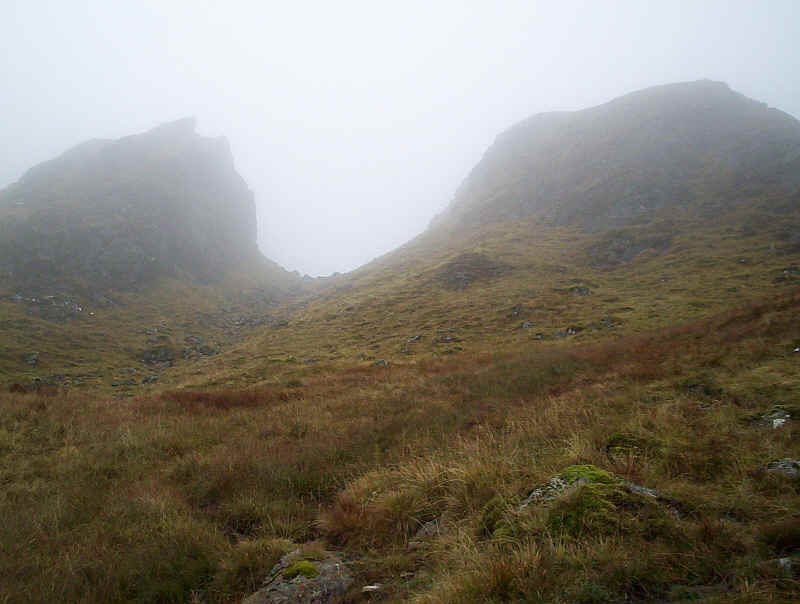 The weather had improved sufficiently to give views of An Caisteal, although the summit itself remained hidden. 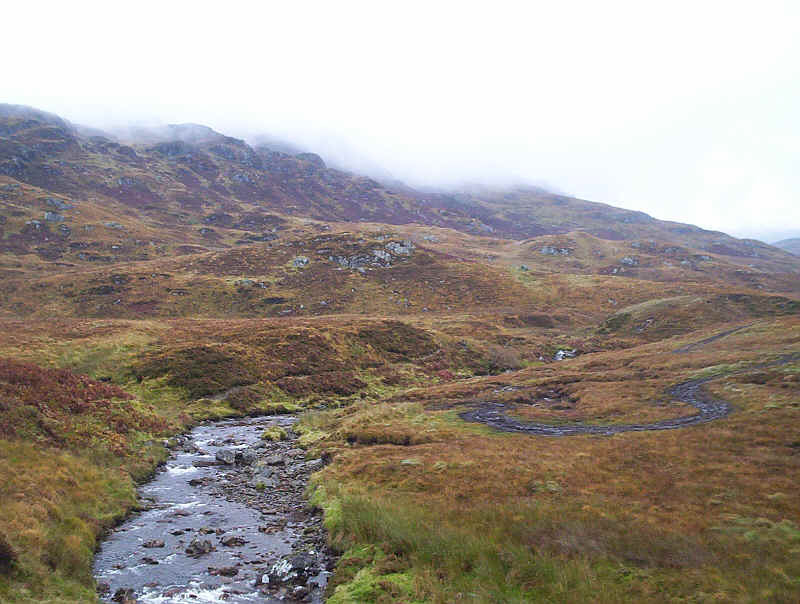 There are a couple of rocky outcrops to bypass, but the way down to the main stream was easy enough without any steep sections and, looking ahead, there were no obvious problems. 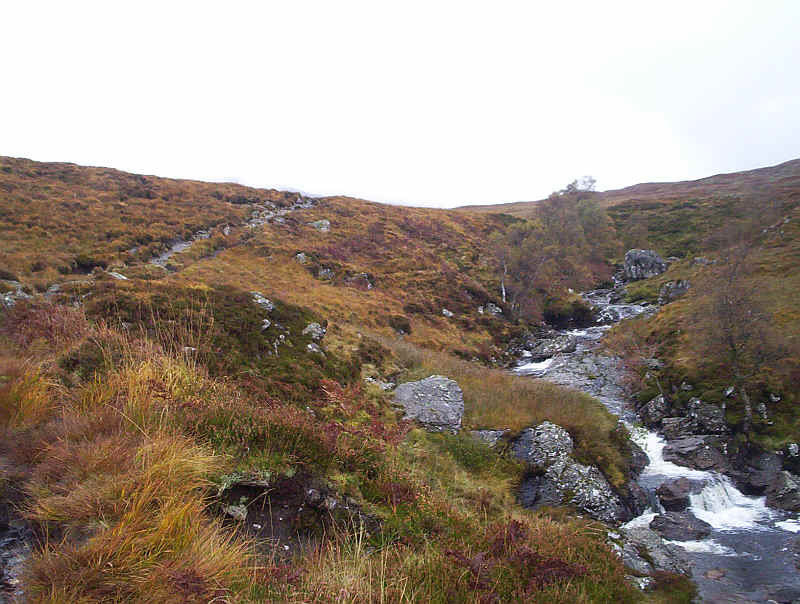 The Allt a'Chuilinn tumbles over rocks on its way down from Coire a'Chuilinn. I was certainly enjoying the return walk more than the outward one. 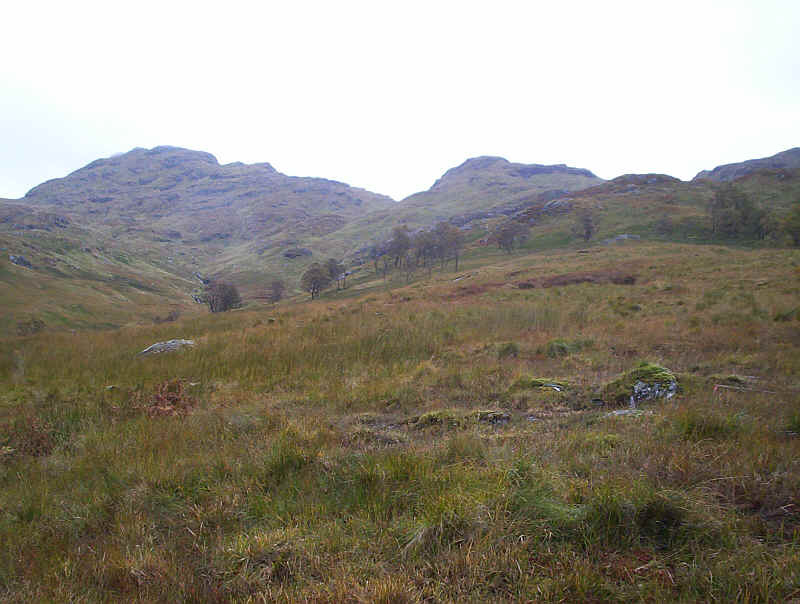 There are a few sections of very faint paths; some are obviously deer tracks whilst others could be human. 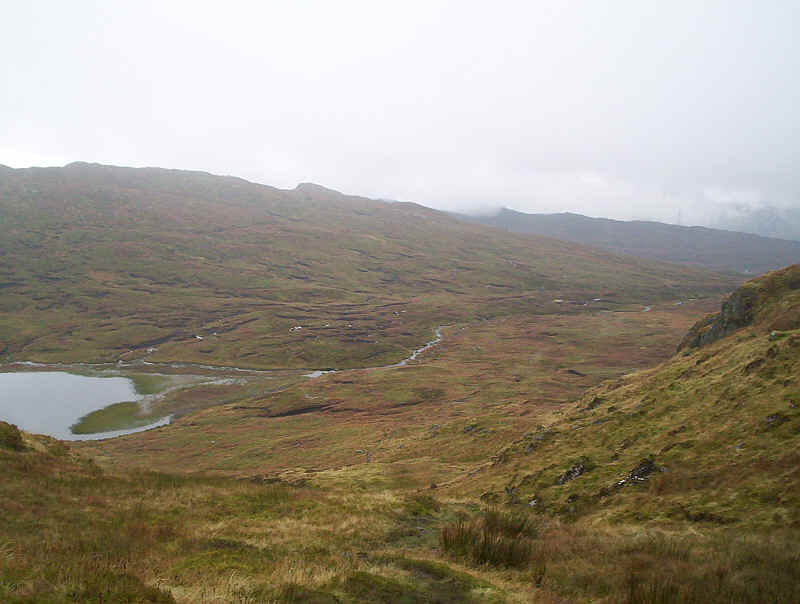 However, whilst still very wet underfoot, there was no need to take detours to avoid quagmires. 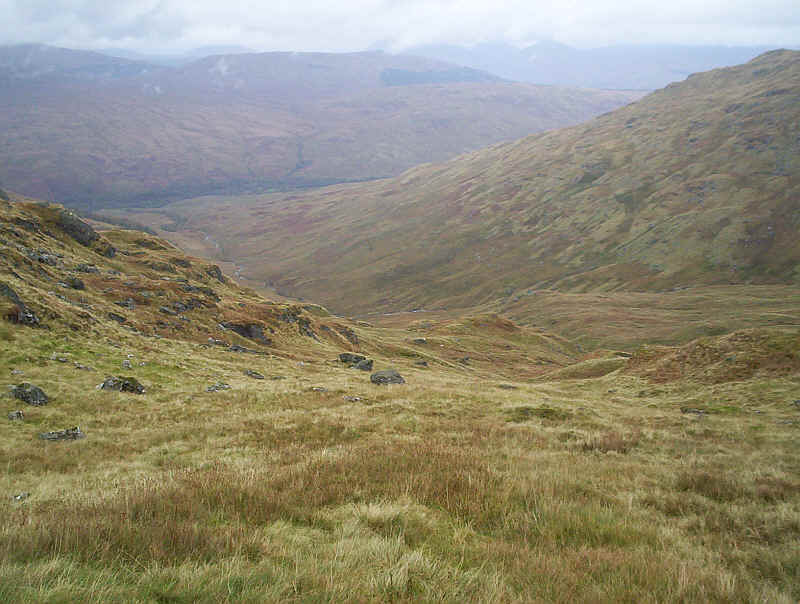 Looking back again at Beinn Chabhair. 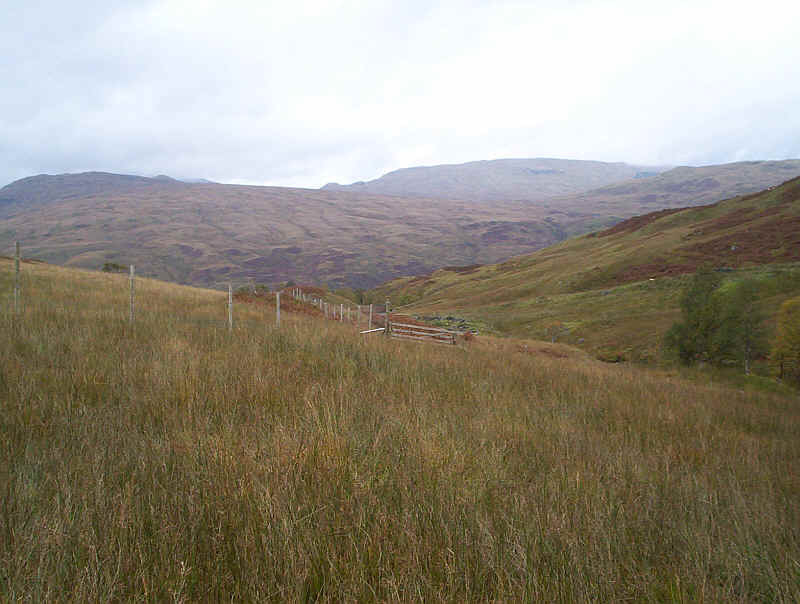 Eventually I reached this deer fence and a gate at the beginning of a vehicle track, which led all the way down to the West Highland Way . 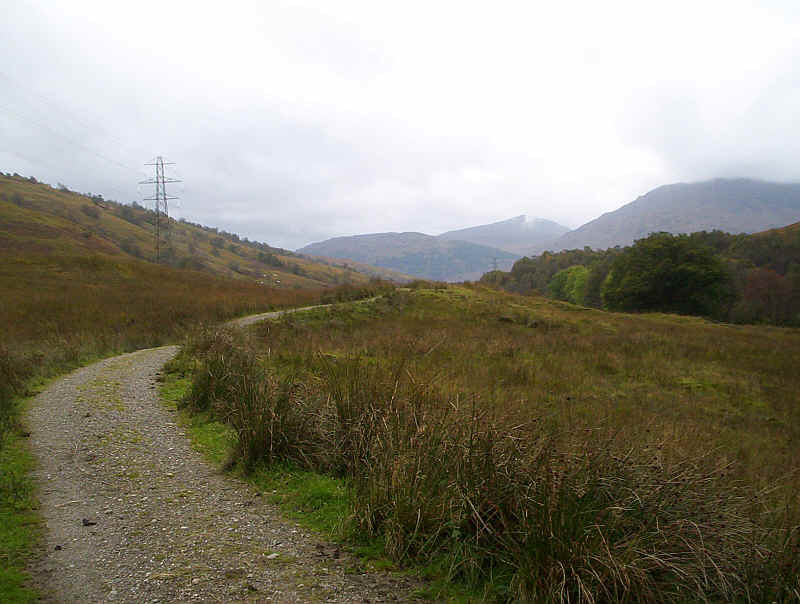 At the West Highland Way, turning south west leads back to Beinglas Farm after about 4km. 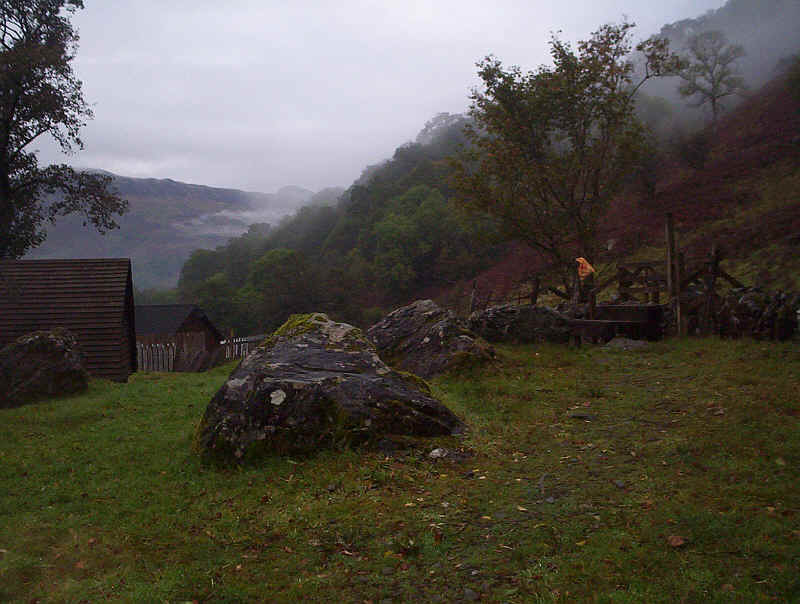 However, I was going to walk north up to Crianlarich to have a meal at the newly opened Crianlarich Hotel (highly recommended by the way), before catching the train back to Glasgow in the evening.